"Later, the manager thought to himself, 'What will I do? My master is taking my job away from me! I am not strong enough to dig ditches. I am too proud to beg. I know what I will do! I will do something so that when I lose my job, other people will welcome me into their homes.' So the manager called in each person that owed the master some money. He said to the first man, 'How much do you owe my master?' The man answered, 'I owe him 8,000 pounds of olive oil.' The manager said to him, 'Here is your bill. Hurry! Sit down and make the bill less. Write 4,000 pounds.' Then the manager said to another man, 'How much do you owe my master?' The man answered, 'I owe him 60,000 pounds of wheat.' Then the manager said to him, 'Here is your bill; you can make it less. Write 50,000 pounds.'" 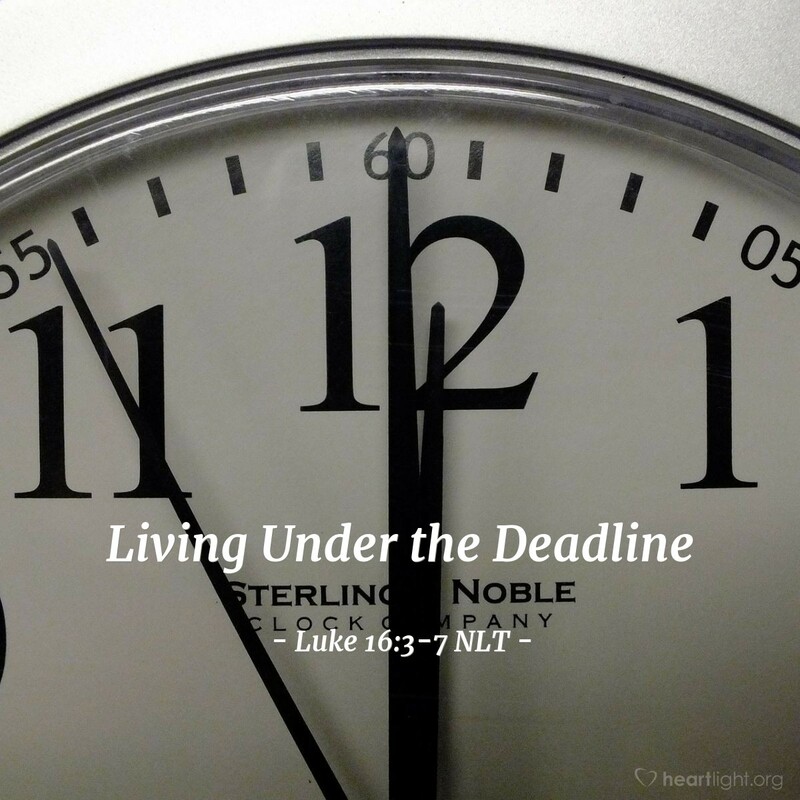 How does living under a deadline impact you? If you are at all like me, your most productive days of work are always the days right before you leave on a trip. You know you have to get the important "stuff" done so you don't let the less important "stuff" get in your way or distract you. In Jesus' story, this man has a deadline. He is going to have to devise a strategy for how to live knowing that a deadline is approaching quickly. We, too, live under a deadline. Jesus is coming soon and we need to live each day with that sense of significance and focus. Father God, please give me a clearer sense of what time it is in the world and in my life. Help me feel the sense of urgency I need as I await the glorious coming of Jesus, in whose name I pray. Amen.